How a $50 limit on the office Secret Santa ended terribly. Secret Santa in the office can be awkward. There are money limits and a whole lot of stress about buying someone something they will really enjoy. It’s all fun and games until… it’s not. And one woman has taken the whole thing a little (a lot) too far. Posting to Reddit, one user explained that in their office there was a $50 spending limit for Secret Santa. 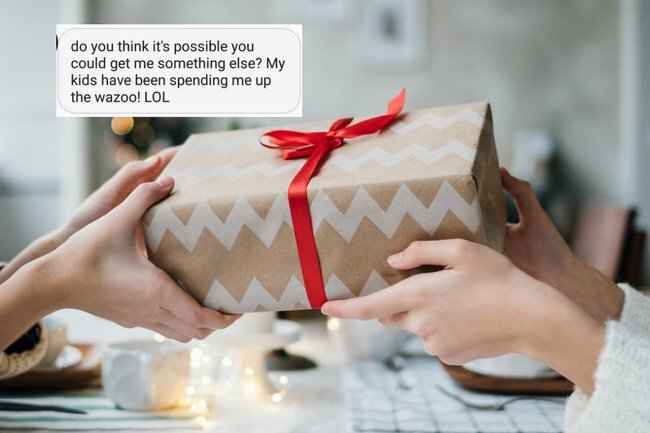 After he bought a coworker a blanket and box of chocolates, he received a very strange message. She began by thanking him, but continued to make an… awkward request. “So… I know this is kinda awkward… but the spending limit was $50 and I looked online and it seems that the blanket and chocolates only add up to about $30? Do you think it’s possible you could get me something else? My kids have been spending me up the wazoo! LOL” she wrote in the text message. He offers to pay her $20 cash to make up the difference, and then she says she would prefer a gift, sending a link to a $120 tablet. When he said no, because it was significantly over the spending limit, she said that because he was an engineer he should be able to afford it. “I don’t mean to be abrasive or anything, but you’re an engineer so you make quite a bit more than I do! LOL. I’d also take $120 cash if that makes it easier for you,” she wrote, and then he got mad. He explained that the spending limit was $50, and $120 for a coworker was out of his budget. She then began to abuse him, calling him “disgusting” and asked him how he lived with himself. After he didn’t reply to her messages, she said she would take the $20 cash. It’s one thing to be a struggling mother, but if that were the case it probably would have been a good idea to opt out of Secret Santa completely. The people of Reddit were mad. “She already crossed the line looking up how much the gifts cost. That would have been the end of the convo for me,” wrote one user. “Yeah op went above and beyond by offering to make up the difference imo. $50 limit NOT minimum wtf,” wrote another. It’s safe to say we should all stick to the Secret Santa limit, or opt out.